At the yearly Pipefitter’s Picnic with Dad’s union. V didn’t make it onto her favorite ride (the Tilt A Whirl! 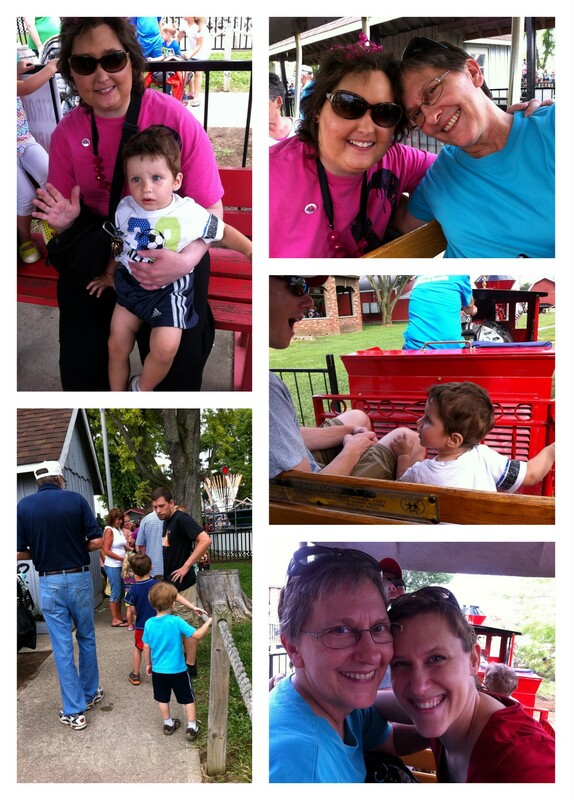 ), but she had a good time watching her nephews riding the kiddie rides, and we all rode the train. A huge milestone passed by recently, rather unceremoniously – July 31 marked a full year of Vanessa being in hospice care. What an amazingly surprising year it’s been, filled with hugs and tears and joy and sorrow. We have been caught off guard, throughout, both by the specific progression of my sister’s health as things have unfolded, as well as from the overwhelming instances of kindness that have graced our lives. There seems to be a point where the pure act of living through this takes all our energy, and communicating about it takes second priority to just getting by. Each of these posts take me hours, to gather the pictures to include, write the content, edit, put everything together and get it out there. Thank you for your patience and understanding when we fall behind in updating here. 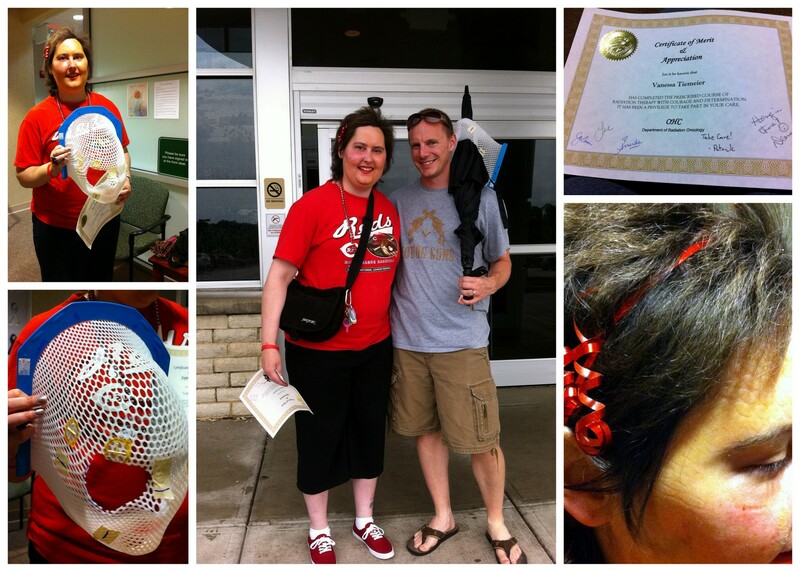 Radiation – Check! That mask creeped me out; I think it looks like an alien. :/ In the bottom right picture you can see the (painless) marks it left on her skin afterwards. Vanessa was a trooper and was so proud of her certificate at the end. 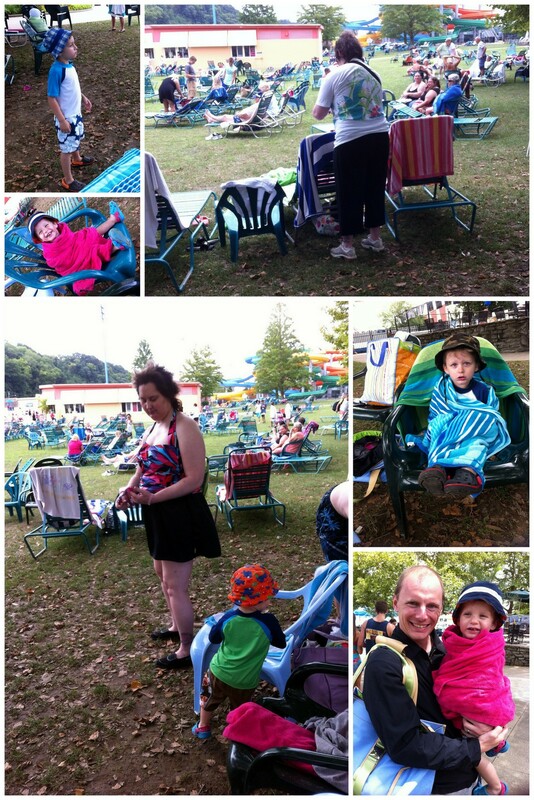 Swimming (on a less-than-warm day) with the boys at Coney Island. V lasted/was interested in swimming about 10 minutes and then sat in a chair poolside to watch us swim… and promptly nodded off. :) In the top right photo, she was walking around taking closeup pics of other people’s towels that she likes the pattern of. I think they thought she was a weird thief, though, so I tried to keep her close to us as best as I could. The palliative radiation has been complete for about a month, and since symptoms often take time to show up, we’re now in a place to see what we’re dealing with in its aftermath. The wonderful news is that it was a success! Vanessa did really well with the actual treatments, and her “eye bump” is now almost entirely gone, from an external point of view. This has resulted in her eye being able to open back up to a normal level, improving her eye sight. She reports the double vision being just about entirely gone, hooray! So far, I haven’t noticed any loss of eye brow hair, and instead of the potential (annoying) dry eye side effect we were expecting, she has a perpetually teary eye on that side, which seems like it would be far less annoying. Her skin did redden but is now pretty much back to normal – so all in all, the procedure was definitely helpful and with little side effects thus far to speak of. Vanessa recently had a liver test done to check into that as a possible cause for her recent bruises, but it came back normal, so I guess we can keep chalking up her bruises to the ol’ clumsy gene we all have! ;) V has experienced some swelling off and on, and that continues. V’s chin has increased in “numbness”, and the sensation is rather aggravating for her. Sleeping has been a struggle lately off and on, with a lot of tossing and turning as V’s chin bothers her, or other physical sort of sensations (having to pee a lot, back hurting her, etc.). Tracy from hospice adjusted some of her medications (for anxiety & nerve pain), though, and that has really helped. Vanessa does nap a lot more now – she might disagree as they aren’t always formal, purposeful naps, but I catch her dozing off a lot on the couch across from me as we’re working quietly in her living room in the afternoons! 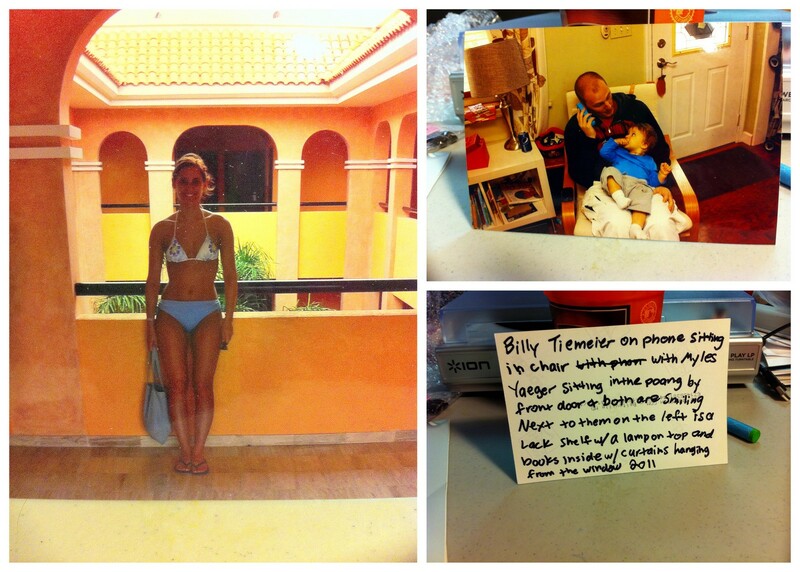 One of V’s most recent projects was writing captions on the back of (some older, some newer) printed photos. The one on the left I just love, taken by Billy on their honeymoon to Mexico. The one on the bottom right shows the caption she wrote for the top right photo. She got the kid wrong, but the rest is meticulously perfect. Mentally, Vanessa seems to both continue her changing while staying much the same. Her overall mood has mellowed to generally be what my mom calls “Sweet Vanessa.” Less anger, less frustration, less comprehension, less movement, less participation in conversation. But still getting around (albeit slower), still enjoying herself, still enjoying doing and being and feeling. On a recent day I took about 600 pictures of flowers, and she looked at every single one with me. That care was sweet in and of itself! What really got me, though, was this: Whenever the pictures would “change” -from, say, 13 in a row of some yellow flowers, to then maybe a bright pink one- she would get caught off guard by the change… and consistently make a pure exclamation of “wow!! !” or “so pretty!” or “I love it!! !” When I am feeling low at how reduced her world is compared to what it was, I am grateful for these little reminders that life from her view is still beautiful and full of abundant joys, simple as they may be. Thanks so much for taking time out of your crazy, busy schedule to update us. I always love your posts and how you bring out those golden nuggets of gratitude and silver linings. Love to you all! Thank you so much for sharing. I am always anxious to read the latest on V and how things are progressing, but I totally understand how it would take a lot of time and emotional, physical and mental energy to put these posts together. You are doing a great job Living Sincerely and taking care of V. I am thankful for the insight you give us and for all of the sacrifices you and everyone in her inner circle are making at this time. Love to V and all of you!!!! Thanks for the update. You have a special way of putting so much love into each post. Sending hugs to you all. Your posts are always perfect. Reading them makes me a more empathetic, kinder, overall better person because you bring the heart of everything to the surface. Thank you. Love to read about Vanessa is doing! V and your family is amazing and such an inspiration! Thank you Jessica for all the time it takes for you to get ready for the updates that you put out there for all of us to keep up with Vanessa’s journey. I know we will continue to pray for your whole family but with the emphasis on Vanessa. I hope and pray things work out to the best for everyone. Love to all of you.